What If I Don’t Wear My Dental Appliances? An agreement always needs to be made between doctor and patient before any treatment. The contract states the doctor will treat the patient to the best of their ability and expertise, and then the patient needs to follow up therapy with proper care. This pertains to all dental care. Q: I have finished orthodontic treatment. I left my retainers at my friend’s house, and I never got them back. Now my front teeth are getting crooked. What can I do to straighten my teeth? A: The most difficult part of the complete orthodontic treatment process is maintaining the final treatment result. Mother Nature has the tendency to return crooked teeth that have been moved and straightened back to their original position. The retentive stage of orthodontic treatment is more important than the active stage of tooth movement. Teeth moved to corrected aesthetic locations tend to return to their original positions. The longer the bone and tissues are allowed to reattach and reorganize, the more stable the new location will be. Minimal time is more than six months; some dentists prefer to retain indefinitely. Removable retainers need to be worn as directed. Since the appliances can be removed, the patient may not wear the appliance leading to relapse. Some malocclusions need permanently fitted bonded fixed wires and appliances for retention. Once the teeth have shifted enough that the removable appliance will not reseat, active treatment to move teeth needs to be restarted if you want the teeth straightened. The same theory applies to all removable dental appliances. Over time, teeth move and will change position. 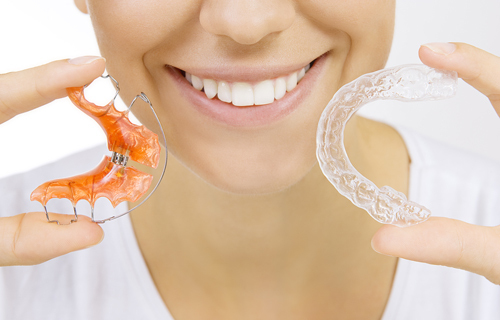 Anti-bruxing appliances, night guards, snore guards and partial dentures are precision retainers, made at the position of your teeth at a point of time. The appliances are constructed, then adjusted and inserted. The patient needs to return to the practice as needed for adjustments so the appliances can be comfortably worn and used for the designated purpose. Removable dental appliances only work when used in the mouth. The time and expense of fabrication and insertion is a waste if it is not worn as directed. The teeth on which the appliance is made will shift if not worn regularly, and teeth on the opposing arch will also move, changing how the teeth bite together. This also applies to orthodontic therapy if you are not going to wear your retainers after the active treatment phase. Orthodontics can create better arch and tooth position, but without retention, your nice straight teeth will become more crooked and crowded. Q: I had braces. My wisdom teeth are coming in, and now my front teeth are getting crowded. When should they be extracted? A: The pressure caused by the eruption of third molars (wisdom teeth) is believed to cause anterior crowding. Eruption normally occurs between 18 and 21 years of age. After completion of orthodontic therapy, third molars should be removed before relapse. A dentist should extract them, or refer patients to an oral surgeon for extraction before eruption. Do not miss your recall appointments. Remember, to prevent relapse after ortho, wear your retainers as directed and see your dentist for regular check-ups. The supervision of a dentist for thorough post-treatment examinations and proper follow-up treatment will result in the most ideal results possible for your new smile.